Your home is supposed to be your retreat from the world, but if something happens to your sanctuary, you need to be ready to take the appropriate steps to fix it. If your home has been flooded, it is likely that you are experiencing many thoughts and emotions all at once. However, you don’t have to allow these things to overwhelm you. Instead, you can take the appropriate actions to ensure that you and your loved ones are safe. The specific steps that you will need to take depend on several factors, including how long the water has been there and where it came from. Because of this, you cannot assume that your situation is the same as someone else’s flooded home. An expert in flood repair damage will be able to help you assess the damage and appropriate actions necessary for restoring your property. But, you will need to make some decisions yourself prior to hiring a flood damage restoration business. If the water that has flooded your home came from outside, you should consider it contaminated and avoid contact with it. Whether from a terrible downpour, overflowing river or some other natural source, the water entering your home is no longer clean and pure. As it has flowed through the streets, multiple contaminants have interacted with it. Dangerous microscopic organisms and toxic chemicals could be lurking in the seemingly benign water. With more severe flooding, other dangers could have entered your home as well. Contaminated needles, drugs, dead and diseased animals and more could be waiting for you inside. Though you might really want to save some of your possessions, you should not risk your health to do so. Wait until a professional team has taken care of the situation before entering. You will also want to avoid the area if your septic system has backed up. The water creeping up through your pipes is dangerous and should be treated as such. Quit adding any water to the system and obtain help immediately. You can use towels to stop the water from spreading further across the floor and reaching carpeting in the hallway. However, you should not attempt to mop the water up with them and you will have to take serious precautions when it comes to removing and cleaning the dirty towels. For a burst pipe in the home, the first thing you should do is cut off the main water supply to the house. In some instances you can turn the water off at a secondary valve, allowing you to have water in at least some parts of the building. If you aren’t sure, just turn off the main supply. Because the water from a burst pipe is clean, you can take measures to prevent the water from spreading further. You might also be able to move some items out of the way or place waterproof material beneath them to prevent damage. 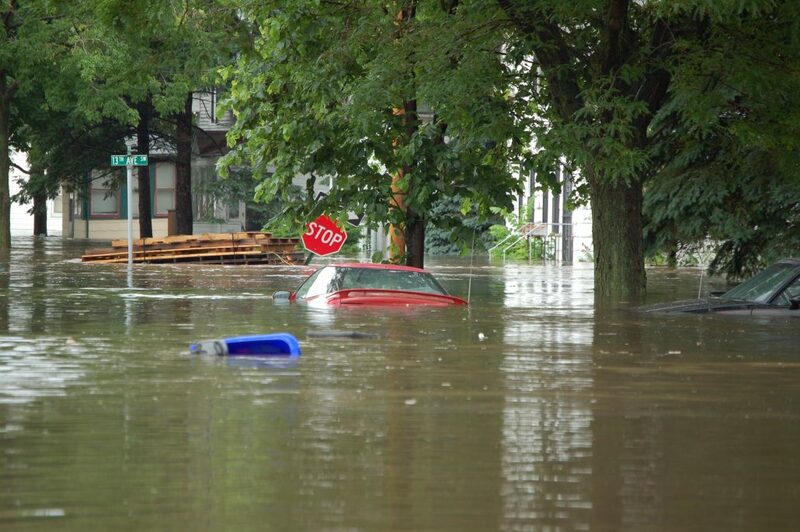 You will need to hire a professional company that is familiar with flood damage repairs. Find a local business that has been around for a while and has a good reputation. Ask folks that you know or look online to find flood damage specialists in your community. If that is not an option, you can search the web. In either case, you should always read reviews for a business before you contact them. Though you don’t have to read everything ever written about the company, you should scan through some reviews left in the past year to find out their customer satisfaction rates. Regardless of the flood source, sometimes the damage can be disastrous with staggering costs. There are really two options in this scenario: file an insurance claim or cover the damage yourself. Assuming you have insurance, you’ll have to check the clauses for what constitutes a valid claim. In many cases, they will differentiate between rain water and flooded sewage, meaning they’ll cover one but not the other. If insurance is not an option, then you’ll have to cover the restoration costs yourself. As in the case with Hurricane Harvey, that may not be an option if the water levels were 7-8 feet high. The next best option would be to try to cut your losses and sell the property to a real estate investor. When trying to sell a damaged home in Houston, a real estate investor will not require that you make the repairs or deal with agents. It’s actually preferred to let the investor handle it because they’ll know exactly how to do it, and they will try to give you a fair offer for what the house is worth pre-restoration. If the flood has damaged other homes in your community it is possible that repair and restoration companies from other areas will set up in your town for a while. While many of these people are professionals who can be trusted, charlatans will always try to scam people when there is a major disaster. By doing your research into the company you can make sure that you are working with established professionals. Don’t be afraid to call the main office to confirm the people are legitimate. A flooded home can be alarming. Once you have secured the area as much as possible based on the type of flood water, you need to contact a reputable restoration company. This is the first step in restoring your home and your peace of mind. But if the damage isn’t covered by insurance and you don’t have the restoration funds yourself, your best bet might be to sell the house and try to come out with your head above water. Let us know if this is something you’re interested in exploring, since we buy houses in any condition and will give you a fair cash offer. Feel free to reach out to us, and we can be your Houston home buyer.